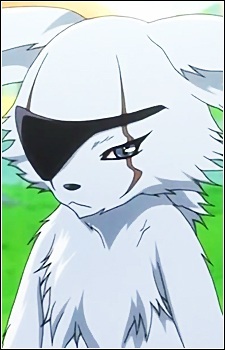 A mysterious creature who wears an eyepatch whom shares a history with Ioryogi, though he now appears to be on poor terms with him, and often challenges him to fights. Ginsei also has frequently stated that Ioryogi's current form is not his true form and also seems to be aware of Kobato's mission. He does not think highly of Kobato or Ioryogi's relationship with Kobato. It is implied that he wants Ioryogi to return to 'Heaven' for unknown reasons, as it was Ioryogi who took Ginsei in and trained him. In fact, it has been mentioned that Ioryogi was the one who gave Ginsei his name. Ginsei's appearance, like Ioryogi's, is implied to not be his actual form as when he stands atop a building overlooking Ioryogi and Kobato's apartment, his shadow is that of a young man with short hair. Ginsei means "silver life" in japanese, and Ioryogi gave him this name because Ginsei's eyes are silver.